CSUN electrical and computer engineering professor James Flynn with CSUNSat1, a cube-shaped satellite about the size of a backpack (sitting in the center of the work table). The satellite will launch in less than two weeks. Photo by Lee Choo. In less than two weeks, California State University, Northridge and Jet Propulsion Laboratory (JPL) will be waiting for a Morse code signal from the university’s first stellar explorer — CSUNSat1, a cube-shaped satellite about the size of a backpack, signaling its successful venture out in space. CSUN electrical and computer engineering professor Sharlene Katz said the satellite project is the first of its kind for the university. The satellite will launch into space on March 19 from NASA’s Kennedy Space Center in Cape Canaveral, Fla., propelled by an Atlas V rocket. It will head to the International Space Station, where it will be deployed into space in April next year. CSUN’s ground station command and mission control, located in Jacaranda Hall, will communicate with it after its launch via radio. One of the most challenging aspects of the mission will be switching the power source from a general standard battery to JPL’s prototype, according to CSUN electrical and computer engineering professor James Flynn. 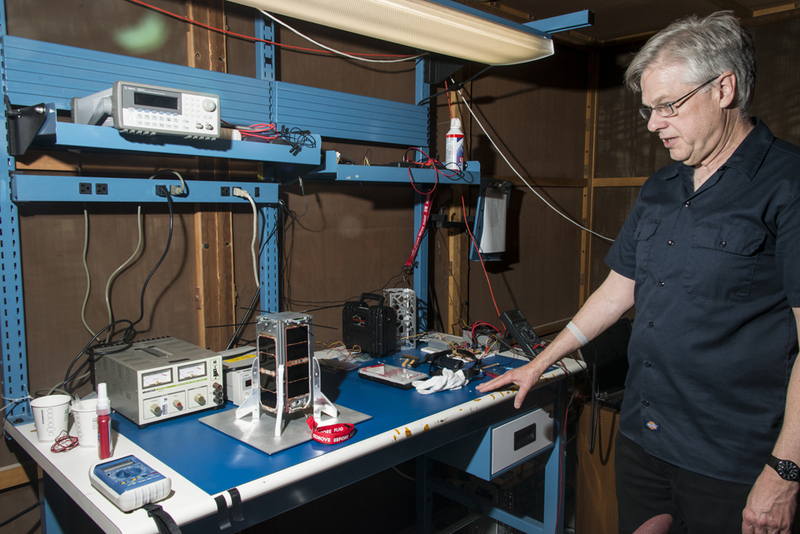 JPL collaborator and CSUN computer engineering alumnus Carl Chesko agrees the most delicate task for the satellite will be the power source switchover. He has faith in it running smoothly. Flynn said one of the rewarding aspects of the mission for the students was learning the importance and value of the work they can do at CSUN. CSUN computer engineering undergraduate Armen Arslanian was charged with creating the deployment code for the satellite’s four antennas. For him, the most challenging yet rewarding aspect of the project was learning to create a computer code that would communicate with the satellite’s code between the main satellite computer and the antenna’s computer. Katz lauded the students for their hard work on CSUNSat1. Flynn added that while everyone is excited for the three-year project to come to a close, there will be some sad feelings when the satellite is dropped off at NASA. For now, the CSUNSat1 team will get to sit tight at the ground station and wait for that Morse code signal hailing it from space, informing it of a successful first mission. For more information about CSUNSat1, please visit www.csun.edu/cubesat.